Karen has registered copyright of all her designs with Copyright House. Karen Evans believes that size really does matter...but it's the smaller the better as far as she is concerned! Karen's business - Miniature Passion, specializes in making miniature dolls house products. After discovering her own passion for dolls house miniatures in 1997, Karen found herself wanting miniatures for her own collection that were special and unique, yet affordable. However they simply weren't there. Despairing with uninspired, factory made models, Karen began producing her own miniatures. In 2011 Miniature Passion Limited was born. 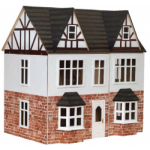 Now stocking 100's of hand made dolls house accessories such as food, furniture, flowers and of course the dolls and houses themselves. Karen has turned her passion into a high quality, market leading, family run business that cares about it's products and it's customers.